The office spaces we inhabit have both physiological and psychological impacts on us. Corporations around the world are now doing what they can to improve those impacts by taking greenery in the office to a whole new level. 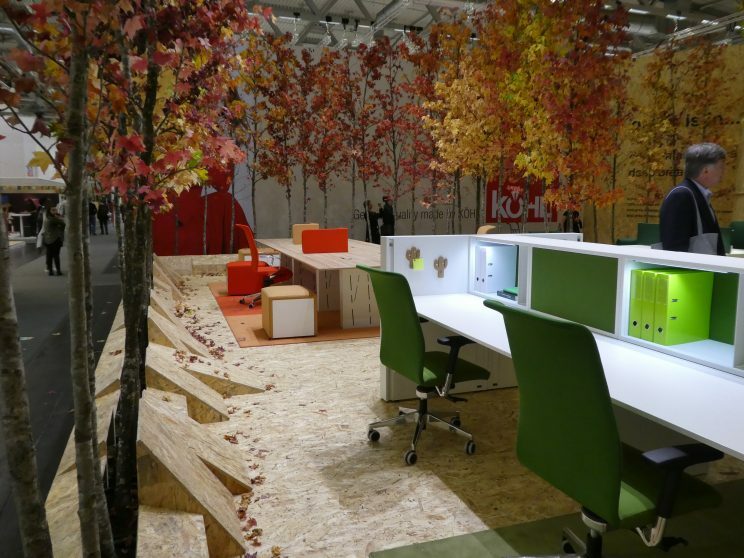 Instead of the simple desk plant, they’re focusing on biophilic design – or the “living” office. But what does this mean? In this blog, we explain what biophilic design is, as well as the key benefits of transporting your workspace into a living office. Keep reading to learn more. Human beings have an innate need to connect with nature, but we have often designed our cities, suburbs, homes and offices in ways that degrade the natural environment around us. Even the recent trend of sustainable architecture has accomplished little in the way of reconnecting us to the natural world. That’s where biophilic design comes in. It’s not simply about filling your office with pot plants; it’s about incorporating nature – from plant life to natural materials such as wood and stone – in a stylistic, sustainable way. Research has shown that natural elements within offices improve blood flow, heart rate and stress levels. Plant life is known to reduce dust and bacteria levels, making the space we occupy for most of our working hours a far more comfortable environment, especially for allergy and asthma sufferers. Incorporating natural stones, such as marble or granite can also improve your office energy, although we recommend including other finishes such as wood and cork to add texture and warmth to the space. With a combination of these elements, your employees’ health, both mental and physical, will vastly improve, helping to reduce the need for sick days. When employees are healthy and happy, they want to be at work. This helps to reduce absenteeism, which leads to improved employee retention rates. It also means work gets completed quicker. Another key element to ensuring your employees remain happy and productive is natural light. Artificial lights have a negative impact on our health, contributing to eye strain, eye fatigue and headaches. Natural light can combat these problems and it can be as simple as making sure all employee workstations are within 10 metres of a window or a skylight – or as creative as Microsoft’s treehouse, where they chose to bring their offices outdoors. By incorporating biophilic design into your office, you’re pointing the way towards creative healthy and productive habitats for your employees. Get started on your living office plan today and speak to the experts at Crest Interiors.